Get crafty and try out different container shapes, sizes, and materials to emphasize the style of the room. We love to use metal baskets or distressed wood boxes with moss to really give the room that cozy farmhouse feel. Another great idea is to use metal vases or containers to display your succulents for a modern design or industrial design look. As always, decorating is about putting your spin on decorative pieces so don’t be afraid to try something new. Putting together a succulent floral arrangement is so fun. After you have selected your container, you’ll need to arrange your succulents. The great news is, you can’t go wrong! Group as many or as little succulents as you’d like depending on the space you’re looking to fill. Whether you enjoy a more minimalist design style and only use one or two succulents or prefer a lively southwest theme with a variety colors, shapes, and sizes, they’ll look stunning. We have even seen succulents mixed with seashells for a nautical look to pink glass vase fillers to accent a chic living room. Don’t let decorating with artificial succulents be overwhelming. 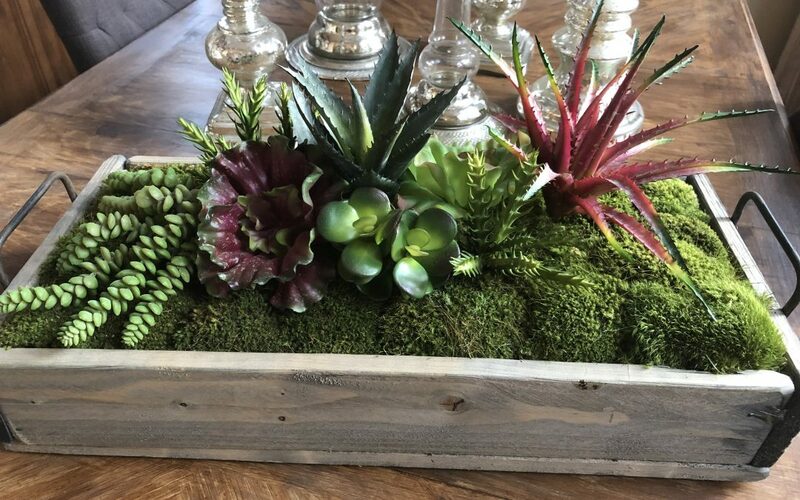 Stop by Robyn’s Nest in Peoria and we can put together the arrangement based on the succulents you select from our Succulent Bar. Now that you have arranged your succulents, you may be asking yourself where would be the best place to display them; the short and simple answer is, anywhere and everywhere! From tabletops as centerpieces, to wall decor, to bookshelf decor, to large corner pieces for the floor, we have designed succulent floral arrangements in just about every place in a home and have yet to be disappointed with the results. Have fun bringing the outdoors indoors with your new succulent garden and don’t forget to share your gorgeous designs with us! At Robyn’s Nest, we love helping you bring out your home design creativity. We enjoy sharing our decorating ideas to help inspire you so please follow us on Facebook and Instagram for daily pictures of our latest curated home furnishing and decorations. For more design tips and tricks to decorate your home with succulents, stop by our store in Peoria to speak with one of our design experts!